Just 2 weeks left to apply! The In Practice project series supports artists in creating new work for exhibition at SculptureCenter. We invite artists to submit proposals for projects and installations to be presented beginning in January of 2010. SculptureCenter seeks proposals that offer new ways of considering sculpture or further the understanding of the discipline and how it can intersect with installation, architecture, performance, and other media. The works and exhibitions created through this series include sculptural objects, installations, performances and artworks that operate between all of these disciplines. Past participants in the series include Fia Backström, Gardar Eide Einarsson, Drew Heitzler, Justin Lowe, Rachel Mason, Lucy Raven, Karin Schneider, Agathe Snow, and Josh Smith among many others. All applications will be submitted electronically via SculptureCenter's website this year. The application, guidelines, FAQ, and downloadable building floorplans and images may be found here. Applying artists are encouraged to visit SculptureCenter during open hours. Questions? Email us at inpractice@sculpture-center.org. Pictured above, left to right: In Practice projects by Samara Golden, Rachel Mason, Wojciech Gilewicz, and Michael Ashkin. Please visit www.sculpture-center.org for complete information on the exhibitions and events. A major art show featuring artists working within a 250-mile radius of Richmond. One painting and two fiber alums are in this show! Gretchen Batcheller, C. Pazia Mannella and Erin M Riley. Leslie Friedman is an incoming printmaking MFA candidate. She sent me some snap shots of her most recent work. They come from a series she did called the Fossil Fools Project and are currently in a show called The Fossil Fools Porject and Other Serigraphs at a gallery in Providence, RI, called AS220. 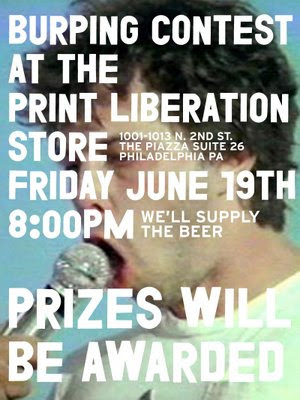 She is very excited to bring her screen printing to Philadelphia, another print passionate city. The purple one is called Prehistoric Route Go, the orange one is ANWR Walk, the green one is Hum Drill Drum, and the blue one is Cycle One Way. thanks Leslie for adding some life to this blog! if anyone else is interested in having their work up please email me! metalwork, jewelry, woodwork and printmaking. The exhibition is held in conjunction with Art of Fine Craft conference, October 1-2, 2009, a biennial conference produced by Lux Center for the Arts and Nebraska Wesleyan University. Entry fee is $30 for 3 entries. Work will be judged from digital images. Entries must be postmarked by July, 1, 2009. The jurors are Jason Briggs, Victoria Goro-Rapoport, Jess Starkel and Sonya Clark. Awards will include a $500 best of show and three $150 juror's choice awards. 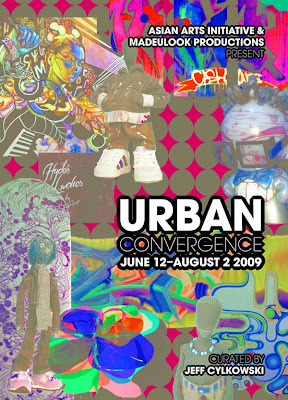 PHILADELPHIA, PA—Asian Arts Initiative and MadeULook Productions host Urban Convergence, a multi-artist exhibition curated by Jeff Cylkowski from June 12 through August 2, 2009. An opening reception will take place at the Asian Arts Initiative, 1219 Vine Street, Philadelphia on Friday, June 12, from 5:30 to 7:30 p.m. The marriage between art and culture has never been more prominent than it is today. Examples abound: Damien Hirst’s paintings as the backdrop of Jay-Z’s music videos; Takashi Murakami’s designs on Louis Vuitton’s accessories and Kanye West’s album cover; graffiti art on Converse sneakers, Sprint advertisements, and energy drinks; Shepard Fairey’s iconic “HOPE” portrait of President Obama. These collaborations reflect an unprecedented merging and morphing of artistic genres and culture—high art with street art, underground with pop, fine art with street culture—that is breaking down social barriers and dated paradigms and clearing space for new ideas and aesthetics. Hailing from metropolitan hubs throughout the country—Philadelphia, New York, San Francisco, Chicago, and Washington D.C.—these artists will share exciting work in a variety of mediums and styles that demonstrate a nationwide convergence toward a fresh contemporary sensibility with an urban edge: Pose II, Joshua Maze, Dave Cramske, Isaac Lin, Rodney Camarce, Jesse Olanday, Sun You, Figments by Ciriaco, Anjni Raol, Shin Ae Tassia, Chanika Svetla, Bret Syfert, Junghwa O’Connell, Miss Tina Wong, Teel MUL, and Dan “R5” Barojas. Urban Convergence is curated by Jeff Cylkowski, a Korean American adoptee and Brooklyn-based multidisciplinary painter, muralist, and hip-hop artist. Before receiving a formal art education from the Pratt Institute, he spent years immersed in urban subcultures. The spirit of that experience continues to inform his work today. In summer 2009, he will be Artist-in-Residence at the Asian Arts Initiative. His residency will include a six-week series of painting and mural-making workshops with local youth in partnership with the City of Philadelphia Mural Arts Program, beginning July 6 and culminating with an exhibition of new work on August 14, 2009. Major support for this project with Jeff Cylkowski has been provided by Artists and Communities, a program of Mid Atlantic Arts Foundation made possible by major funding from The Heinz Endowments, the William Penn Foundation, and the Pennsylvania Council on the Arts. The Asian Arts Initiative is a community-based arts center in Philadelphia that engages artists and everyday people to create art that explores the diverse experiences of Asian Americans, addresses our social context, and imagines and effects positive community change. We host a range of activities including an annual season of performances,, our gallery and exhibition series, and our Youth Arts Workshop and other education programs. Recently relocated due to the expansion of the Pennsylvania Convention Center, the Asian Arts Initiative is now in a new home at 1219 Vine Street where we are contributing to the revitalization of Vine Street and Chinatown North. For more information about the Asian Arts Initiative, please call (215) 557-0455 or visit www.asianartsinitiative.org. Artist Collective NYC is looking for painters, sculptors, filmmakers and multi-media artists for our up and coming summer season. The work we are looking for would ideally have a political edge, playful sexual content and dark sense of humor. We are gathering submissions for a shorts film festival in August and a multi-media event in July. Please forward images, films and websites to Artist Collective NYC@gmail.com. June 5 – August 1, 2009 "Summer in the City"
Since the advent of cities, those with the means have escaped during the steamy summer months. But what of those who remain? 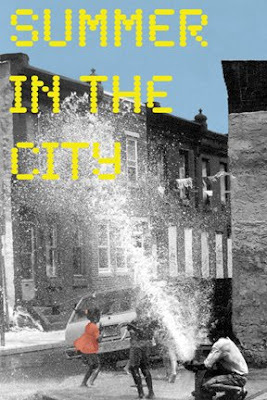 For the months of June and July, Projects Gallery presents “Summer in the City”, a group show resulting from an open call to artists from the greater Philadelphia and Delaware Valley region. The resulting artists run the gamut from current students to established, mid-career artists. Frequently galleries close or reduce their operating hours under the assumption that the sticky days and hot nights leave no audience for art. Projects Gallery believes that, for the peoples that remain, the thirst for expression is not diminished by the change of season. The work in this exhibition is a template of patient visual critique of the experience rather than simple jubilation. “Summer in the City” celebrates these die-hard urbanites and is reflective of their myriad experience. Artists include Jennifer Baker, Henry Berkowitz, Aubrie Costello, Linda Dubin Garfield, Conor Fields,Ashley Flynn, Adam Lovitz, Daniel Petraitis, Bobby Rosenstock, Martha Savery, Allen Spencer and Deborah Imler, Fay Stanford, Jayne Surrena, Mat Tomezsko, Andrew Wapinski, Tamsen Wojtanowski and others. With a broadly interpretive topic and locale constraint, a curious sub-theme emerged. Many of the works seem to observe the destructive nature of humanity on their environment with an air of detachment. In some works, a nearly anthropological or documentarian voice is expressed. A sense of urban decay extends from the abstract to the figurative, from literal crumbling buildings and abandoned lots to the reflexive decay of those who inhabit these settings. Many of these works hint at questioning the role of the urbanite in their treatment of their space, their peers and their community. This undercurrent energizes the collective voice of city dwellers, strengthening a conversation beyond the expected summery escapism. Emerging from their wintry cocoon, Philadelphians take to the streets and stoops, bikes and bars, parks and playgrounds. Much of the featured art shows people outside of their homes, in the environment of the city and the resultant interaction between the two. Each of these varied artists lend a perspective to what summer in the city can mean in all the positive, negative and observationally neutral positions. Including photography, print, glass, sculpture, collage, works on paper, mixed media installation, as well as both figurative and abstract work --- there is something for everyone in this firmly Philadelphian show. “Summer in the City” will be on display June 5 – August 1, 2009. There will be an artist opening reception First Friday June 5th from 6 - 9 p.m. The opening will embody the energy of a backyard keg party as we celebrate our own summer in the city. The reception is free and open to the public. 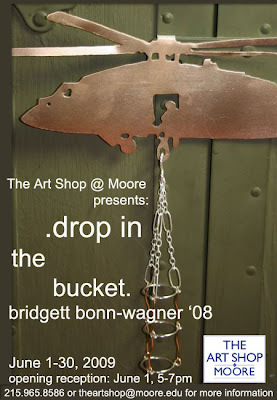 Bridgett Bonn-Wagner, a 2008 graduate of Moore College of Art & Design, exhibits her new line of jewelry and installation, Drop In The Bucket, at The Art Shop @ Moore College of Art & Design from June 1-30, 2009. Opening reception with the artist: Monday, June 1st , 5-7 pm. Closing reception with the artist: Friday, June 26th, 5-7pm. Pierced sterling silver Black Hawk Helicopters in silhouette act as both sculpture and display for one-of-a-kind military inspired jewelry with a modern feminine edge. Bonn-Wagner, raised in a military family, remembers seeing helicopters hovering over the military bases where she lived. She uses military iconography to inspire all of her jewelry, but this is her first professional endeavor where the display for her jewelry line is an integral part of the installation. The jewelry is cast resin over vintage Desert Storm playing cards, surrounded by 10K gold and 24K gold plate over sterling silver, making the adornments feminine, funky, and affordable. Nothing in the collection is priced over $62, excluding the helicopters. The First Mondays @ Moore began in March 2008 as a featured alumnae installation project of the Art Shop @ Moore. Alumnae are invited to create a site-specific installation or series of works for the Art Shop’s window space. Ideally, the project bridges a gap between the artists’ studio practice and a commercial body of work. So far, twelve local alumnae, graduating between 1992 and 2007, have participated in the project. For more information about this ongoing installation series, contact Katie VanVliet at kvanvliet@moore.edu. The Art Shop @ Moore is a gallery shop on campus at 20th & The Parkway. We exclusively feature original works by Moore students and alumnae. Moore College of Art & Design is the first and only all-women’s art and design college in the country; we just wrapped up a year-long celebration of our 160th year!